Why Use Alcohol in Recipes? There are a vast number of wonderful recipes which use some form of alcohol as an ingredient in sauces, marinades or as a main flavor ingredient. What do you do when you don't have that particular liquor or you will be serving children at dinner or you do not partake of any alcoholic beverages? In many cases, you can make some non-alcoholic substitutions. In order to be successful, you'll need to be armed with information and background on why the alcohol is used and the flavor goal of the recipe. Why Use Alcohol in Cooking? In general, the main reason any alcoholic beverage is used in a recipe is to impart flavor. After all, the finest extracts with the most intense flavors are alcohol-based, particularly vanilla. Fermentation intensifies and concentrates fruit essence into liqueurs, cordials, brandies and wines. Other foodstuffs are distilled into potent liquors specifically to boggle the senses but still appeal to the palate. Many object to the alcohol content, but it is a completely natural by-product which happens daily in nature, even within the human body. In many recipes, the alcohol is an essential component to achieve a desired chemical reaction in a dish. Alcohol causes many foods to release flavors that cannot be experienced without the alcohol interaction. contains yeast which leavens breads and batters. Some alcoholic beverages can help break down tough fibers via marinades. Other dishes use alcoholic content to provide entertainment, such as flambes and flaming dishes. Wine and Kirsch were originally added to fondue because the alcohol lowers the boiling point of the cheese which helps prevent curdling. In the case of leavened goods, there is no ready substitute for beer. Instead, choose a different recipe which uses another leavener such as yeast, baking powder or baking soda. For marinades, acidic fruits will usually do the trick. For flambes and flamed dishes, you're out of luck if you don't use the alcohol. For flavoring alone, you will often have a number of substitution options. Does the Alcohol Burn Off? Alcohol not only evaporates without heat, but the majority also burns off during the cooking process. How much remains in the dish depends on the cooking method and amount of cooking time. Those bourbon-soaked fruitcakes would have to turn into bricks before the alcohol evaporates. A bottle of Guinness in a long-simmered stew is not going to leave a significantly measurable alcohol residue, but will add a rich, robust flavor. A quick flambe may not burn off all the alcohol, whereas a wine reduction sauce will leave little if any alcohol content. Heat and time are the keys. Obviously, uncooked foods with alcohol will retain the most alcohol. An alcohol burn-off chart has been compiled by the U.S. Department of Agriculture with information on how much alcohol remains in your food with specific cooking methods. Keep in mind that this is the percentage of alcohol remaining of the original addition. If you are not a math whiz, the calculations might confuse you. For example, take a liquor that is 100-proof. The same dish with 10-proof wine, or 5 percent alcohol by content, would end up with less than 2 percent alcohol content remaining after baking or simmering for 1 hour. Non-alcoholic beverages by U.S. law contain less than 1 percent alcohol. Longer cooking and/or higher heat gets rid of even more alcohol. If you're worried about legalities, long cooking should do the trick. Always inform your guests when you are cooking with alcohol in case they have allergies or health problems. You'll have to use your own judgement on substituting for alcohol in recipes. Sweet recipes will require different substitutions than savory. Amounts will also make a difference. You wouldn't want to use a quarter cup of extract to replace the same amount of Amarett liqueur. And remember, the final product will not be how the original cook intended, but it should still be tasty. Look at the main ingredients of your recipe. Usually, the main liquid ingredient can be extended to cover a small amount of required alcoholic ingredient. If the amount is less than a tablespoon, it can probably be omitted although flavor will be lost. Any variety of juices and/or tomato juice can often be substituted in marinades. Non-alcoholic wine or wine vinegar can be substituted for wine. Add a bit of honey or sugar to emulate sweeter wines. Extracts, flavorings, syrups, and juices can be substituted for flavor-based liquors and liqueurs. They will usually need to be diluted. 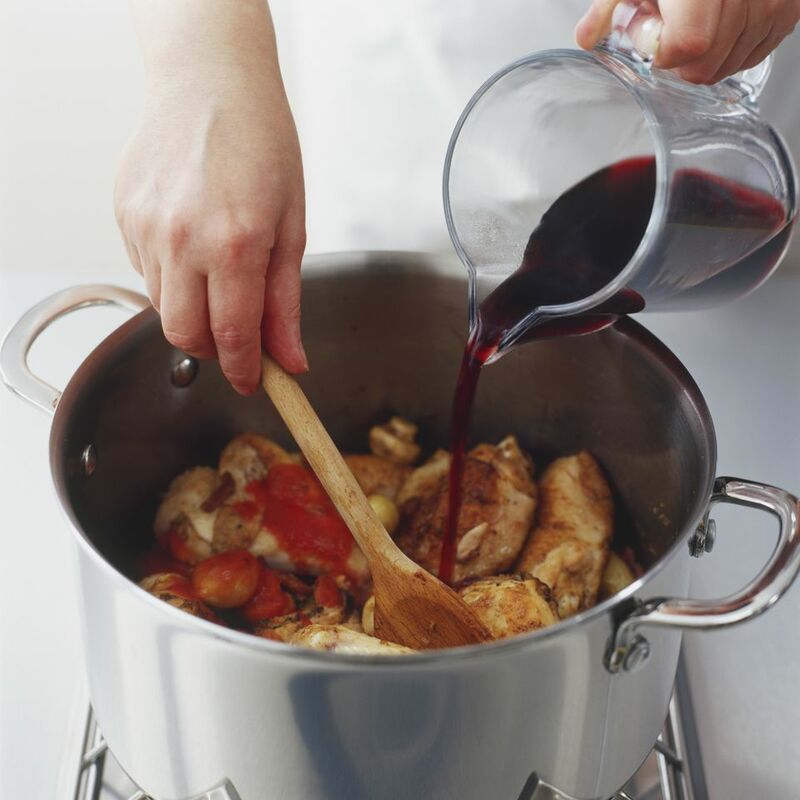 Use non-alcoholic wines over cooking wine or sherry. It should be drinkable. The cooking wines and sherries are loaded with sodium which detracts from flavor and adds a salty flavor to the food. To help burn off more alcohol and reduce potential injuries when using it for flamed dishes, be sure to warm the liquor before adding to the hot (the food must also be hot! ), and use a long match or lighter to ignite it. Always tilt the pan away from you when igniting. The liquor should be added very last possible moment and lit as quickly as possible to avoid the liquor soaking into the food. Let the alcohol burn off enough so the flavor does not overpower the dish. Tomato sauce or juice combined with Worcestershire sauce or soy sauce can work as a substitute for many robust liquors. and high alcohol-content liquor do not mix well since the alcohol freezes at a much lower temperature. You may end up with runny ice cream or sorbet. When using milk or cream in a sauce containing alcohol, be sure to burn off the alcohol before adding the cream or the sauce may curdle. If the alcoholic ingredient in the recipe is intended to be the main flavor and you must avoid alcohol, find another recipe. It just won't taste the same. What Does the Culinary Term En Papillote Mean? Should You Buy the Butterball Oil-Free Electric Turkey Fryer?